This year’s 92nd annual Nathan’s hot dog eating contest was being marketed as “The Rematch II: This time it’s personal”. Six time champion Takeru “Tsunami” Kobayashi is going after 2007 champion Joey Chestnut who won by eating a world recordÂ 66 hot dogs and buns in 12 minutes. 21 people qualified for this year’s Nathan’s hot dog eating contest. This year, a hot dog eating newcomer was creating a buzz in the competitive eating world. 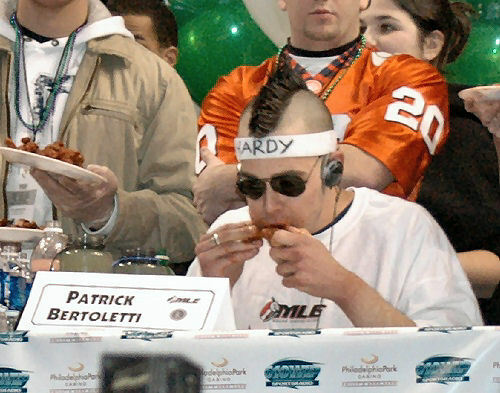 Patrick Bertoletti is ranked #2 in the world, behind Joey Chestnut, and in front of Takeru Kobayashi. Crowd favorites that made it to this year’s Nathan’s hot dog eating contest: Crazy Leged Conti, Arturo “Grande” Rios, Erik “The Red” Denmark, Eric “Bandlands” Booker,Â Juliette “The Violet” Lee, Tim “Gravy” Brown, Sonya “The Black Widow” Thomas, and Tim “The X” Janus. This year, the contest was only held for 10 minutes instead of the 12 minutes of last year’s competition. I doubt we will see a new world record set for awhile due to the contest being 2 minutes shorter. 1986 was the last time the contest has been 10 minutes long. The reason for the change is that contest officials found paperwork from 1916 that specified the time limit was 10 minutes. Looking at it in terms of health, its a move in the right direction. 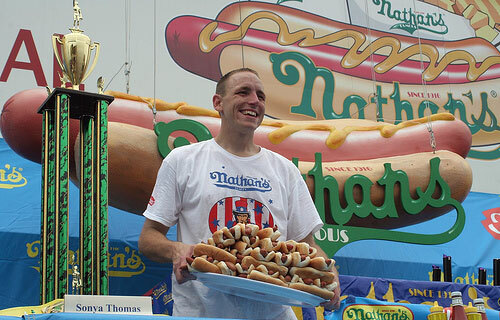 Last year Joey Chestnut ate a record 66 hot dogs. In terms of calories, that’s 19,600! With the shorter time limit this year, we will definitely see lower calories and cholesterol. The Nathan’s hot dog eating contest has become a rivalry between America and Japan over the past 20 years. The last time someone not from America or Japan has won the contest was in 1984 when Birgit Felden of Germany ate 9 and a half hot dogs in 10 minutes. After making it there, you have 10 minutes to eat as many hot dogs as possible. You have to eat both hot dog and bun, but not necessarily at the same time.